The original New Deal was a bold, visionary effort that transformed the economic and political life of the country. The Green New Deal could do even more. The Green New Deal has moved from a policy few had ever heard of to a litmus test issue for Democrats, thanks mostly to agitation from Rep. Alexandria Ocasio-Cortez. How should we think about the original New Deal in pushing for a green one? As we think about a possible Green New Deal, what lessons does the original New Deal hold? The first lesson is about ambition. The Green New Deal resolution is in line with the original New Deal’s ambitious aims. The New Deal introduced a wide array of programs that addressed a broad spectrum of the country’s problems. The Green New Deal tries to do a similar thing. It doesn’t just attack climate change, but also social justice, jobs, wages, infrastructure, modernization, and more. That’s what the Roosevelt administration tried to do. A lot of centrist types object to the Green New Deal’s proposed wide swath of programs. They think it’s too broad, too inclusive — that we should focus on climate alone. What do you say to that? I saw a Washington Post editorial to that effect. I was appalled. Focusing on climate alone would be so narrow-minded — and it would make a Green New Deal politically dead in the water. I admire the Green New Deal’s approach to climate change (which is, by the way, a lot like the target-setting already in place in California, my home state). Yet climate change isn’t the only serious problem we face as a nation. There’s the issue of low wages, poor quality of jobs, regional decline — and, of course, massive inequality. You have to address those issues, which have led to tremendous political alienation in the country and fueled the right-wing populism that we see benefiting Trump and the Republicans. If you don’t deal with the needs of working people, you can kiss all major climate policies goodbye. You’ll still be living in the world of Trump. A lot of people today aren’t fully aware of the breadth of the New Deal’s achievements. You have been working on this project, the Living New Deal, cataloging its heritage and legacy. Give us a sense of the breadth of these programs and what the New Deal’s heritage has been. I have been amazed since we started the Living New Deal at what I didn’t know, even though I thought I was reasonably well-informed about the New Deal. For example, at one point we decided to write summaries of all New Deal programs. I thought there would be a couple dozen, but they added up to over sixty, and we still haven’t done all of them. New Deal programs covered pretty much everything: financial reform, farm support, industrial price and trade policies, housing — both housing finance and public housing — and economic recovery. It was also very “green” and included many conservation programs, like reforestation and soil protection. Then, of course, there were the well-known ones like Social Security and the relief programs. The unemployment relief programs were many and varied. Some of them people have heard of, like the Civilian Conservation Corps (CCC) and the Works Progress Administration (WPA). But some, like the Civil Works Administration or the National Youth Administration, almost nobody’s heard of. Altogether these were very effective in providing jobs for upwards of 12 to 15 million Americans who were out of work and lowering the unemployment rate from 25 to 10 percent. There’s also the physical heritage of the New Deal — the post offices, the bridges. We still depend upon this infrastructure. That’s right. It was not just a relief program, but a program of investment all over the country in infrastructure and civic works. The biggest single program was road-building, which includes bridges. But there were enormous numbers of dams and waterworks, water supply systems, city halls, schools, sewage projects. You name it, they did it. The New Deal brought large parts of the country into the twentieth century. It was a modernization program, bringing about a modern road system, clean water and a modern electric grid — even to the most remote back corners of the country. You can imagine a similar program today supplying everyone with high-speed internet or bringing energy conservation programs and green energy to every town, every rural area, every household. I recently interviewed Daniel Aldana Cohen about his Jacobin piece on the possibility of a housing program as part of a Green New Deal. He emphasized the fact that a lot of the architects who were involved in the New Deal went for beauty. The dams of the Tennessee Valley Authority were meant to be beautiful as well as functional. The New Deal had plenty of room for art and commissioned literature. These were not Philistines. That’s absolutely right. Good design was the cherry on top of the infrastructure sundae: they built all this practical stuff that’s long-lasting and serves the public, then added to this commitment to building things that were beautiful and uplifted public spirits in a very depressing time. We could sure use that again today, in our own depressing time. The American people view government as kind of boring, at best — a practical necessity, but not something that brings elegance and uplift, music and theater and artworks, to their everyday lives. Yet the New Deal did that. It was a tiny part of the cost of the overall programs, but it added so much. Even today, when people look back to New Deal the thing they remember most are the murals in post offices and civic buildings. You organized a conference in the midst of the 2008 financial crisis about the New Deal and its lessons for getting out of that crisis. I remember somebody in the audience mentioned the fact there was a sculpture somewhere on the Berkeley campus with a plaque that brags that no public funds were used in commissioning or executing this sculpture. The sensibility that has evolved over the last seventy years against using public funds for things like sculptures is remarkable. It’s an ideology that is fine with luxury in the corporate sector and in private-sector buildings. Enormous, grotesque houses for the wealthy, country clubs, art in corporate skyscrapers — all that is fine. But the public should get nothing but the leanest and meanest. That kind of thinking is the result of the revolt against the New Deal that started once the capitalists were back on their feet in the 1940s. The argument was that the government can’t provide all this good stuff — people need to meet those needs through private capital. In fact, that has been a magnificent illusion of bourgeois ideology for two hundred years. The government is a necessary evil rather than something that’s part of our daily lives and part of the way we not only govern ourselves, but how we live and enjoy ourselves, as well. The pursuit of happiness doesn’t have to be in private only. It should be a collective, public, governmental goal, too. A rap against the original New Deal — which you hear fairly often partly because Hillary Clinton and centrists Democrats revived it as a rap against Bernie Sanders and the revival of social democracy, and unfortunately people on the Left have been quick to pick up — is that the New Deal was racist; that the exclusions in Social Security, housing, and many other New Deal programs were adjuncts of white supremacy. What do you say to that? To fairly evaluate the New Deal, you have to go back to 1930s and ask: where was America at the time? This was a white supremacist country, as it always had been. Racism was the rule of the day. Jim Crow laws were widespread not only in the South but in the North. Think of what we had done up to that point: the long-term genocide and suppression of native peoples, black slavery, repression and exclusion of Chinese, Mexicans, Filipinos, and so on. White people were very begrudging of giving anything to people of color, and not just African Americans. That’s the world the New Deal inherited. The Civil Rights Movement and its fundamental challenge to white supremacy hadn’t happened yet — that came a generation later. The New Deal didn’t challenge the racial order head on and failed on that front in a number of ways. But that’s not the same as saying it was simply racist. In fact, most of the leading New Dealers — such as Eleanor Roosevelt, Harold Ickes, Frances Perkins, and Harry Hopkins — were outspoken antiracists and made a systematic effort to include people of color in New Deal programs. As a result, most New Deal programs were reached out to native peoples, black people, Latinos, and Asians in an unprecedented way. People of color worked in all the big relief programs, and there were specific investment, education, and health projects aimed at oppressed peoples. For example, the New Deal’s Indian policy was the best deal Native Americans had seen from the federal government up to that time. We would do it differently now, but the New Deal made a genuine effort to allow native sovereignty, employed tens of thousands of natives in work programs, improved reservation lands, built schools and provided for native education, and so on. On the other hand, President Roosevelt compromised with the Southern Democrats in Congress, who were a big part of the New Deal coalition and a mixed bag of populists and power-brokers in the Jim Crow South — not to mention big growers in California and Texas. Those compromises led to farm workers and domestic workers being left out of two major pieces of legislation: Social Security and the National Labor Relations Act. Most of those labor forces were African American and Mexican American, plus some Asian Americans. It’s a mixed record. Yet even though the New Deal fell far short of ending racism, it helped set in motion the forces that would overthrow Jim Crow in the postwar era. Its modernization programs brought most of rural America into the mainstream, its employment programs brought jobs, better wages, and dignity to workers of color, and its services programs provided better health, education, and skills to many underprivileged Americans. In addition, the employment of African Americans in federal line agencies tripled during the New Deal era. On top of that, Roosevelt appointed an unprecedented number of African Americans to high positions in the federal government, including the first federal judge. Many such people, such as Mary McLeod Bethune, Lawrence Oxley, and Robert Weaver, went on to be civil rights leaders. In sum, simply stating that “the New Deal was racist” is not helpful, underestimates the New Deal’s impact on racism in America, and undermines the idea that anything as ambitious and progressive as the New Deal can be done in this country today. One particular sore spot is housing. A lot of the redlining practices affected the geographical pattern of housing for generations afterwards so happened then, what about the redlining? How did that come to be? Housing exclusion and racial segregation were ubiquitous in America at the time. The South had different system where black people lived on the back alleys in the town, so it looked like they were living closer to whites. But they were kept “in their place” by Jim Crow. The North was less clear about those hierarchies, but racial segregation was very popular among white people. The effort to exclude went back to the nineteenth century when upper-class whites started using the first deed covenants to keep the riff-raff out wealthier neighborhoods. That meant not just people of color but European immigrants, as well as industry and commerce. In the early twentieth century, developers and local governments created zoning laws that separated cities into zones to protect upper-class, single-family residential areas. Sometimes these were explicitly racial, sometimes they weren’t; but the effect was exactly the same. All of that precedes New Deal housing policy by fifty years. When New Deal housing policies were written, agency administrators at the Home Owners Loan Corporation (HOLC), Federal Housing Administration (FHA), and US Housing Administration (USHA) were chiefly interested in saving homeowners, creating more homeownership, and providing more housing for working people. Unfortunately, they largely went along with established practices of racial segregation. But there’s a mistaken view among some critics that the FHA and HOLC invented segregation and imposed their rules on a reluctant America. That’s nonsense. They were going along with the existing racial divisions and housing practices. What was the hand of the real estate industry in redlining? The real estate industry was right at the center of it. It wasn’t just “white preference” for segregation — the industry had a direct financial interest in making sure that it could create these exclusive zones on the model of the upper-class districts like the Country Club District in Kansas City, Roland Park in Baltimore, Forest Hills in New York, or St Francis Woods in San Francisco. They wanted to make sure their investments in these upper-class developments were not going to be jeopardized. Hence, exclusionary zoning laws and deed covenants were eagerly supported by the National Association of Real Estate Boards (NAREB), which had become very powerful in the early twentieth century. Not surprisingly, NAREB helped Congress write the legislation for the HOLC and FHA, and their people moved into the agencies to write the administrative guidelines, as well. The Roosevelt administration just basically went along with it, though? To a certain degree. They were not in a position to overthrow the racial structure of America. Perhaps they could have done better and taken stronger positions on civil rights, as when FDR refused to endorse a proposed federal anti-lynching law. Yet some of them were quite outspoken and opposed FDR’s decision on that and other compromises. Roosevelt himself always played his cards close to the vest, so we don’t know exactly what he thought about racism. As a practical matter, he believed that if he bucked white supremacy, the New Deal coalition would come apart. Nevertheless, the New Deal did counter America’s racial order in a variety of ways. Of utmost importance was that the relief agencies employed over a million people of color and discrimination of any kind was barred by Executive Order. 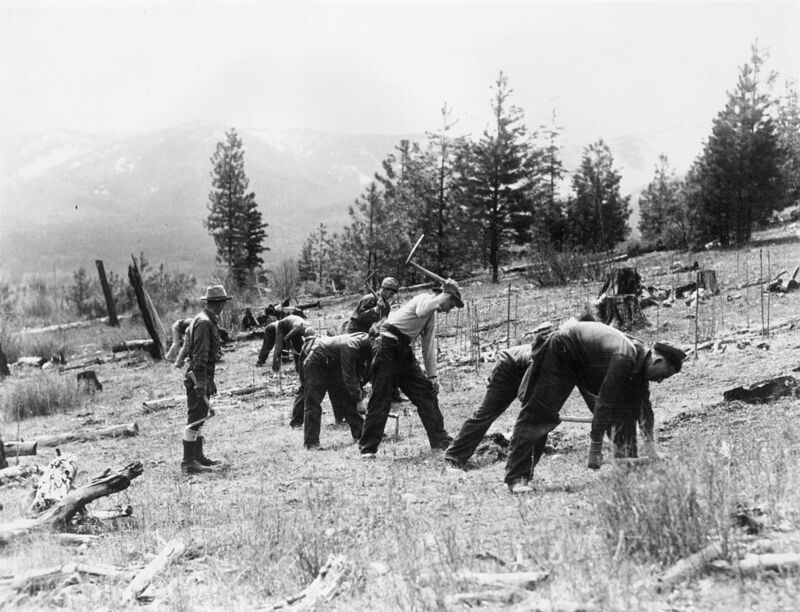 The Civilian Conservation Corps (CCC) is often cited as a segregated program, but at the outset the CCC was largely integrated in the North; only intense opposition from nearby residents in mostly rural areas (and the South) forced the CCC to separate whites from blacks and other people of color. Similarly, the Works Progress Administration (WPA) employed hundreds of thousands of African, Asian, Mexican, and Native American citizens every year — a higher percentage than in the private labor force. Relief workers were paid equal wages because WPA leaders like Harry Hopkins and Ellen Woodward demanded it. These were not all male construction workers; women of color were hired as teachers, social workers, librarians, and in other professional and service jobs. Many of these used integrated teams. The New Deal ended Hoover’s aggressive deportation of Mexicans and invested heavily in Puerto Rico, the Virgin Islands and Hawai’i. Many New Deal projects specifically addressed the needs of poor communities of color, providing housing, clinics, schools, and education, as well as assisting tenant farmers. WPA recreation facilities like swimming pools were meant to be integrated, an unprecedented move — unless white protest made this untenable. In short, the outlook, policies and programs of the New Deal, while far from perfect, marked an important step forward for the federal government and contributed to the welfare and advancement of millions of citizens of color. Roosevelt had a big congressional majority and swept into office multiple times with big margins of victory. Now, we have a Senate controlled by crazy Republicans. The House has some lively progressives, but most of the Democratic delegation is nothing to write home about. And we have a cretin as president rather than a somewhat enlightened aristocrat. How do we navigate the present political terrain? Or is this a project for the longer term? There is a very serious de-legitimization of the political ruling elite right now because of Trump. Trump may have been doing us a favor, just because his administration is so disgusting that people are turned off. The situation is so degraded that we do have a pretty solid majority of Americans who think this is nuts. Bold progressive leadership is going to look more enlightened and appealing, by contrast. The other thing we have is climate change. At least two-thirds of Americans think climate change is a serious problem. We can see it around us in floods, hurricanes, droughts, fires. You can mobilize a lot of people around a Green New Deal because of climate change. And then, of course, there’s the economy. There’s a lot of tub-thumping from Trump about how great it’s been, but the Great Recession was catastrophic. Millions of people suffered greatly from unemployment and housing foreclosures, and after ten years of recovery wages haven’t budged. Many jobs are terrible — they’re not protected by unions and they’re more exposed to hazards and exploitation because regulations have been cut. Most working Americans are very well aware of these conditions and are looking for a means of seeing real improvement in the quality of jobs, raising wages, and less inequality. Again, a Green New Deal can appeal to a broad swath of working people. We also see a split America today, a situation that a Green New Deal must address. We tend to fall back on lazy simplifications about urban America versus rural, evangelical America versus progressive, rational America versus people duped by Fox News; and so on. But the fact is that Trump captured a lot of votes from people who are genuinely desperate after thirty years of deindustrialization and the long-term decline of small towns, small industrial cities, and rural areas. That decline has been devastating. The Green New Deal doesn’t address clearly enough this problem of rural decline and rural suffering. The New Deal did and that was crucial to its popularity and success. We need a similarly massive investment, job creation, and public works program to aid damaged areas and to bring them into the twenty-first century the way the New Deal brought so much of the backwoods America into the twentieth century. You can imagine the possibilities: serious investment in small towns, improving schools, providing clean water, upgrading sewage plants, building new civic institutions, improving parks, and insulating buildings and homes. This should be done with the active participation of local people, doing useful work in and for their communities. You could have teams of skilled people working with local youth to teach new skills. Local folks and politicians would support that because there is direct evidence that a Green New Deal is serving them, their community, their kids. The Green New Deal must not just meet the challenge of climate change. It must also revive the economy, raise wages, and renew lagging communities across the country. In short, it must speak to the vast majority of Americans or it is, as I said at the beginning, dead on arrival. Richard Walker is a professor emeritus of Geography at the University of California–Berkeley and director of the Living New Deal, which is documenting and mapping the legacy of the New Deal, especially its public works.